The remnants of Hurricane Irma moved north through Florida yesterday, bringing severe flash flooding to Jacksonville and dumping rain on Georgia and South Carolina. By Tuesday morning, roughly 15 million people in Florida were without power, according to the Department of Homeland Security. At least 48 people have died as a result of the storm, including at least 13 in the continental U.S., per AP. Meanwhile in the Florida Keys, an estimated 25% of homes were destroyed and another 65% suffered "major damage," FEMA director Brock Long said. Conditions are so bad that the Defense Department estimated that the 10,000 people who rode out the storm may need to be evacuated. "My heart goes out to the people in the Keys," said Florida Gov. Rick Scott. "There's devastation. I just hope everybody survived. It's horrible what we saw." Irma was downgraded to a tropical depression Monday night as it moved toward the Tennessee Valley. 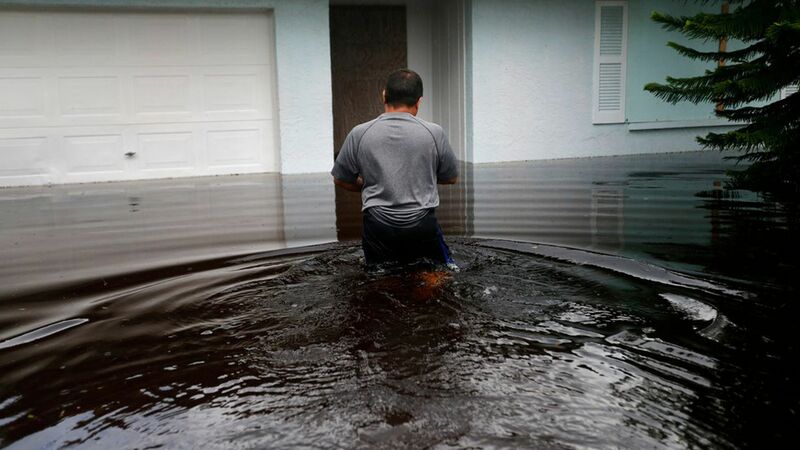 Jacksonville, Florida, sheriff officials tweeted that 356 people were rescued from flooding on Monday. In Georgia, wind gusts reached 64 mph in Atlanta, and the coastal city of Brunswick saw over 6 inches of rain. Charleston, South Carolina, experienced a nearly 10-foot storm surge and 5-6 inches of rain. President Trump will visit Florida on Thursday, according to Sarah Sanders. Go deeper: Irma's evolving forecast.